Caroline and Robert Boller have worked for some of the biggest wineries in the world. At last they decided to set out on their own and open a gastropub, Hill Haven Provisions®, focusing on local craft beer & wine, with a small menu of farm to table eats. As part of this new project they wanted to have their own wine brand, and chose the Robie Point name because it is especially meaningful to them. The Western States® 100 Mile Endurance Run is the world’s oldest 100 mile race. Considered one of the most competitive ultras on earth, it follows trails crossing the mountains of Lake Tahoe, California. The course spans from Squaw Valley to Auburn ascending over 18,000ft and descending almost 23,000ft. Robie Point marks mile 99. Here, footsteps painted on the road guide runners off the trail to the finish line at the Placer High School track. It’s this final mile of the race where runners realize they’re going to make it, that all the work they’ve put in has paid off. A time to begin savoring an experience few people in the world can comprehend. 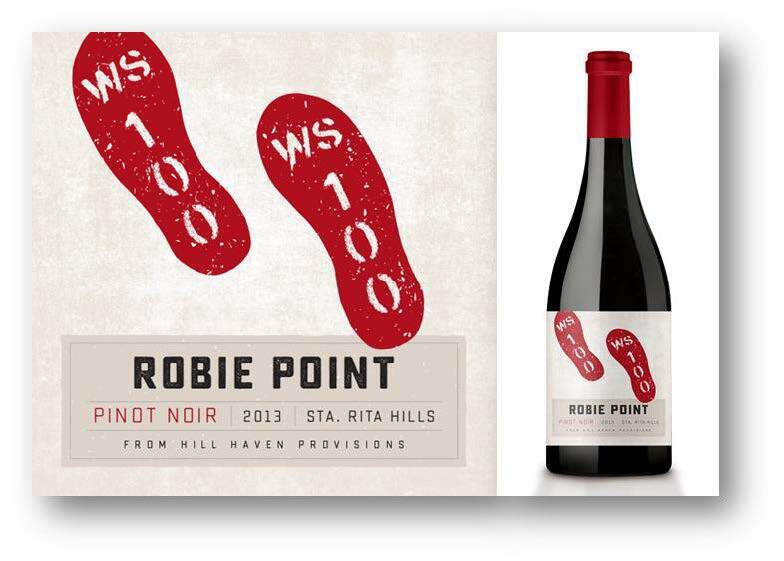 Robie Point Pinot Noir comes from the revered Santa Rita Hills appellation. This elegant wine boasts notes of black cherry and allspice, balanced with integrated tannins and earthiness. The wine is bottled and will be labeled and available to ship by the start of this year’s Western States® 100. The wine is available to order from Hill Haven Provisions® today. About the Bollers: Caroline was voted #4 ultrarunner in North America in 2016, has won two ultra-distance National Championships, run for Team USA and is an Olympic Marathon Trials qualifier. Robert is the craft beer enthusiast and avid home chef. He’s been a trail runner ever since leaving his life as a commercial food photographer in NYC and moving to California to join the wine business.